On Monday, October 29, 2018, ZSEM welcomed a group of undergraduate students from St. Joseph’s College of Commerce in Bangalore, India. As part of the 1-week ‘Travel & Learn’ program, the students took a tour of Europe, visiting Vienna, Prague, Budapest and Zagreb. ZSEM’s Management professor and Associate Dean Goran Oblaković, PhD, lectured to the group on ”General Management and Business in Croatia”. Students gained insight into doing business in Europe which they stated they were thankful for as it was the perfect way to wrap up their European tour. Dora Lončarić, head of ZSEM’s Career Center, explained to the students all of the possibilities that ZSEM students have in terms of internship and job placement in Croatia and internationally, while highlighting the career paths of ZSEM’s successful alumni. 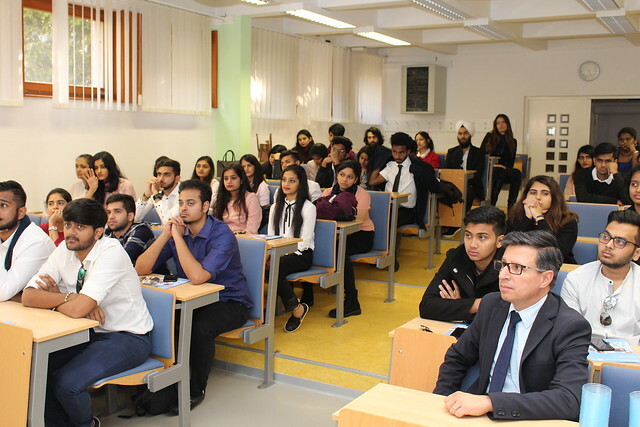 Meanwhile, the head of ZSEM’s International Office, Javier Aguayo, presented to the group ZSEM’s wide network of international partners (+140 universities worldwide), which its students can take advantage of through the study abroad /student exchange program during their undergraduate and graduate MBA studies.